Have you eve taken your two favorite recipes and combined them together? Well, I took my two popular recipes on this blog; pecan pie and dark chocolate brownies and combine them together. OMG!! I know, I know it’s not nice to boast and use the word ultimate to your own recipe. 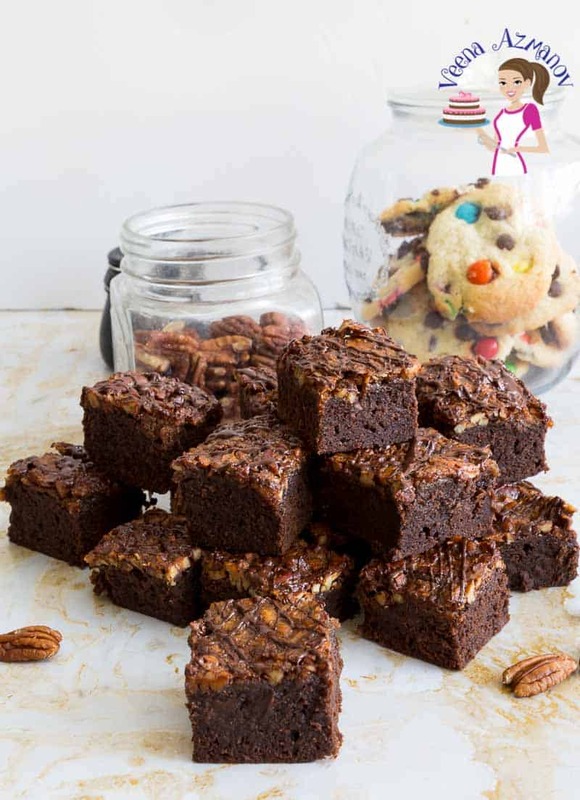 But, I can’t help calling this the ultimate pecan pie brownies. 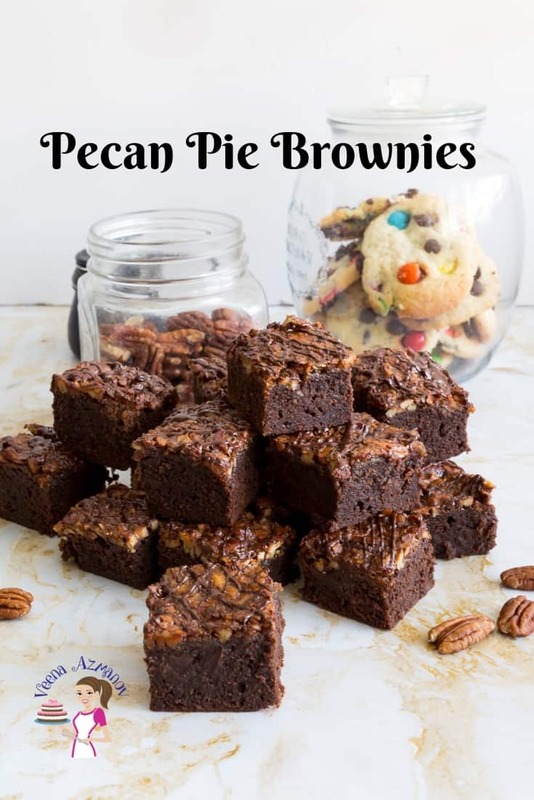 Well, you know my love for brownies is huge because I shared so many brownie recipes already but you also know that I love pecans from the many pecan based recipes on this blog. So, this was like the best of both worlds. I must warn you though, if you are on a diet do not make them for anyone else. Oh, I did that a few weeks ago and I almost wanted to kill myself because I could not eat any and everyone around me was raving about them. .. they are so good. Honestly, does not get easier than this. The brownie recipe is simpler than making a cake. You don’t even need a mixer, a bowl and whisk is plenty. A rich decadent brownie batter is partially baked while you prepare the pecan filling. Then the brownie batter is topped with the pecan pie filling and baked until set. The brownie itself is rich, with a deep color and delicious. The pecan pie filling sweet and moist that just melts in your mouth with a crunch from the pecans. Using dark chocolate with the sweet pecans works best with this recipe as the bitterness from the dark chocolate helps offset some of the sweetness from the pecan pie topping. 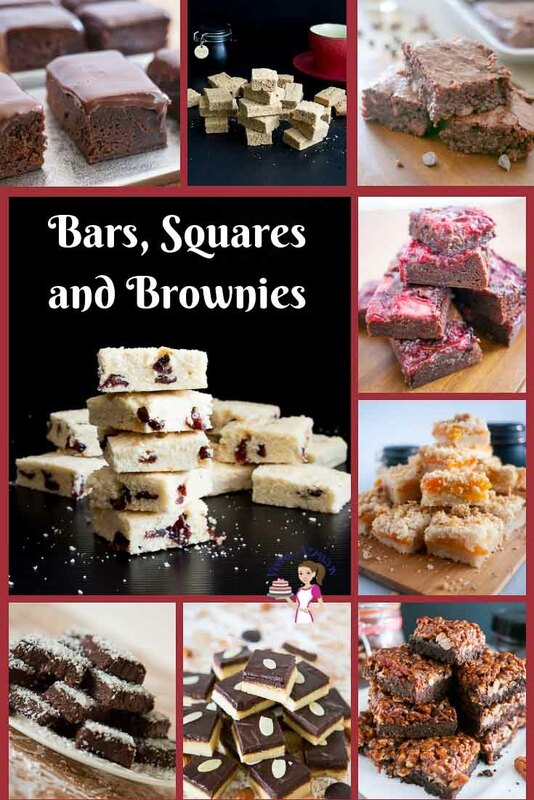 Chocolate – I love using dark chocolate in my brownies but any chocolate you like to eat would great. Please do not use baking or compound chocolate. The taste of your brownies primarily depends on the quality of your chocolate. Butter – I always use unsalted butter but if salted butter is all you have, go ahead and use it and omit salt in the recipe. 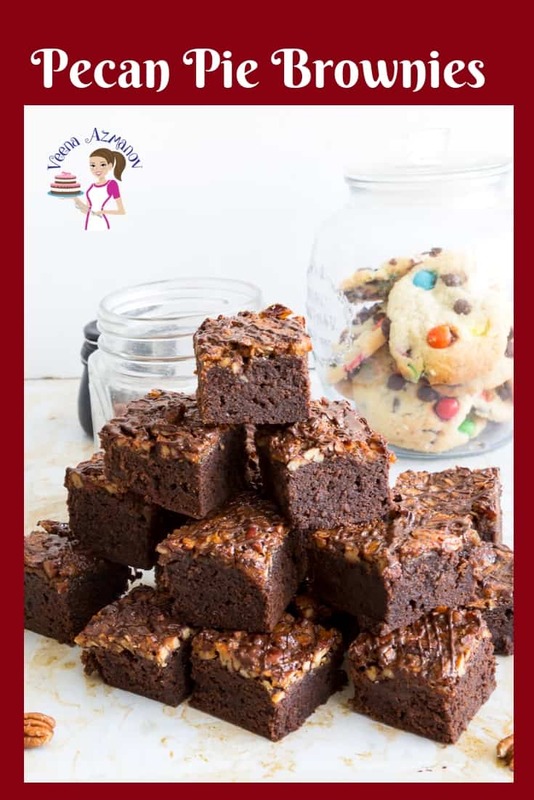 All-purpose flour – This adds a firm texture to the brownies but if you prefer to make them gluten-free, you can omit the flour and add 3 tbsp of cornstarch instead. The brownies will be a little delicate but just as delicious as ever. Sugar – The white sugar contributes to the top crust we like on a brownie while the brown sugar contributed towards making them fudgier. So, try using both sugars. Golden Syrup – This adds a nice golden color if you can’t use golden syrup you can also use light corn syrup. 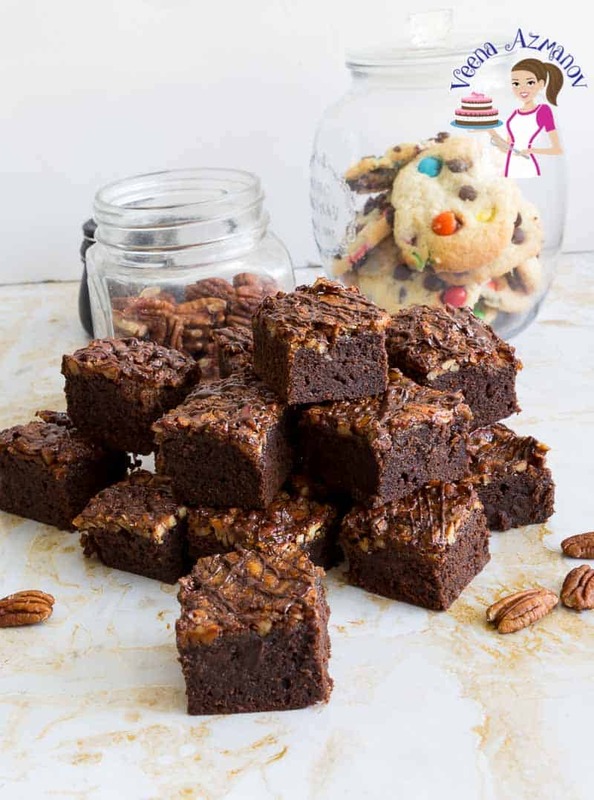 Pecans – Well, it’s pecan pie brownies but if you prefer you can switch to other nuts like macadamia, hazelnuts or almonds too. Preheat oven 170 C /340 F.
Whisk flour and salt in a bowl. Add sugar to melted chocolate butter mix. Finally, add the flour mixture. Mix well until you have a smooth well-incorporated batter. Pour into a parchment lined 8 x 8 square cake pan. Bake at 170 C/340 F for 15 minutes until the top is just beginning to set. In a bowl combine – brown sugar, melted butter, golden syrup, salt, vanilla, and lemon juice. Whisk well for about 2 minutes until sugar is almost dissolved. Add in the eggs one at a time mixing thoroughly. Followed by the chopped pecans. Continue to bake for 15 to 20 minutes more until the top is almost set. Cut the brownie into 16 squares as shown in the video. 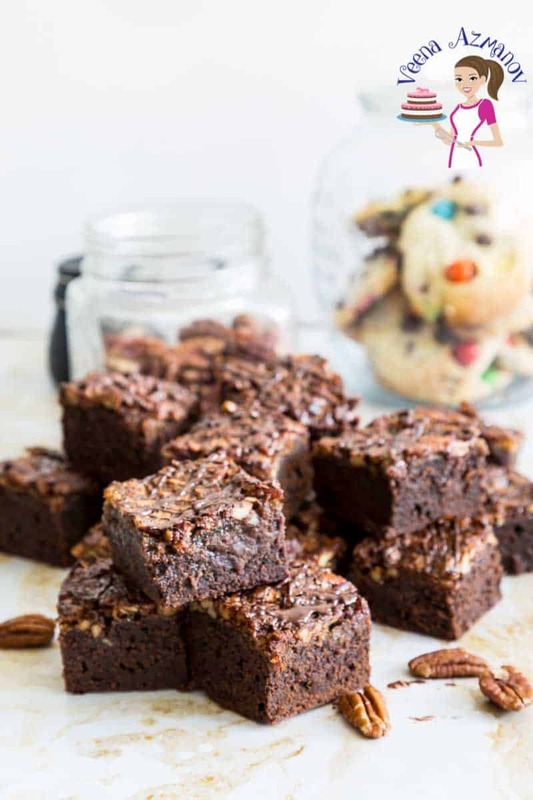 A dessert with the rich bitter flavor of dark chocolate and sweetness from the pecan pie filling makes this the ultimate pecan pie brownies. A simple, easy and effortless recipe that's quick to mix and easy to bake in just over 40 minutes. A perfect fall dessert for anyone who loves chocolate brownies and delicious pecan pie. Try making this for your next family festive celebration. In a bowl combine - brown sugar, melted butter, golden syrup, salt, vanilla, and lemon juice. Thank you, Cathleen. Yes, for me it sure is the best of both worlds. You are most certainly a devil in the disguise of a baker. I try so hard to stay away from sweets and usually I do a fairly decent job. 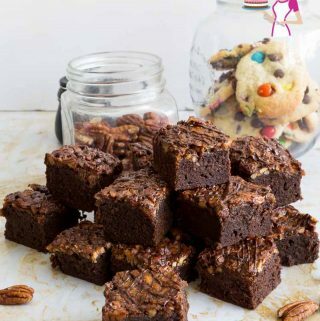 Pecan pie and brownies in one tempting treat?? I know I wouldn’t be able to resist. And to make things even better? I don’t have to drag out the mixer. WOW!! This recipe is a MUST make. Aww, thank you, Marisa. I know you always on a diet but this is for those days when you can afford it. These are so decadent I can’t even take it. I love pecan pie, I love chocolate. How perfect are these going to be?!? Wow these brownies are incredibly beautiful! This is a really great job and I can not wait to try your impressive dessert. Thank you, Dan. I hope you try these. OMG!!! These look scrumptious. I know that these would not last long at my house. They didn’t last more than a few hours in our home too Dana. 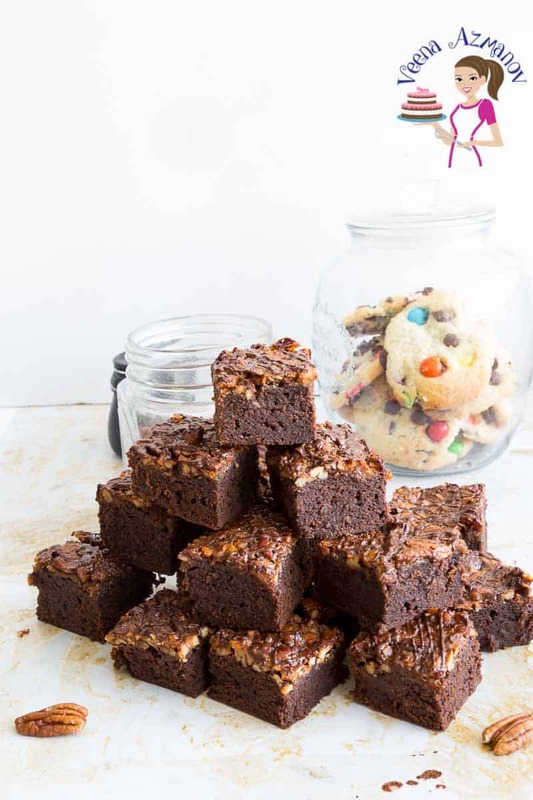 You are speaking my language with these brownies! They are also two of my favorite desserts, and they look absolutely amazing! Thank you, I hope you try these. You’ve done it again, Veena, with these. They look so moist and chewy, I could just reach in and take a bite. Thanks for sharing. Thank you, Deborah. They are delish.. They were gone in an instant.